Tokyo: Early last year, Cheng Wei, founder and chief executive of the Chinese ride-hailing juggernaut Didi Chuxing, tried to resist taking money from legendary investor Masayoshi Son. Cheng told the SoftBank Group chief he didn’t need the cash because his company had already raised $10 billion, according to people familiar with the matter. Fine, Son said, then suggested he might direct his support to one of Didi’s rivals. Cheng relented and took the investment: $5 billion in the largest fundraising round ever for a tech start-up. Son pulled a similar manoeuvre in November, publicly warning Uber Technologies that if he didn’t get the deal he wanted, his backing would go to archrival Lyft. Uber also took the money in a $9 billion investment unveiled last week. Masayoshi Son has been an unstoppable force in the technology world over the last year. As he lined up a roster of big backers—Saudi Arabia’s crown prince and Apple’s Tim Cook among them—for SoftBank’s planned $100 billion Vision Fund, Son took stakes in scores of businesses engaged in a dizzying array of activities: ride-hailing, chip-making, office-sharing, satellite-building, robot-making, even indoor kale-farming. Son’s idiosyncratic deal-making has confounded admirers and detractors for years. And the latest frenzy has been no exception. In deal after deal, according to people involved, Son pressed to meet founders face to face, encouraged them to take more money than they wanted and wielded his outsized chequebook as a weapon. Along the way, he rattled rivals with his growing influence and changed the game of start-up investing—for better or worse. “There really isn’t a precedent for this," says Steven Kaplan, a professor at University of Chicago’s Booth School of Business who co-founded its entrepreneurship program. “The jury is still out on whether it will work." Son’s investment strategy defies easy categorization. He portrays himself as a true believer in the information revolution, a proponent of the so-called singularity—the notion that one day computers will mesh with human brains and bodies. But Son has sceptics aplenty. They wonder how ride-hailing fits with money management. Or what satellites have to do with indoor farming. Son, 60, has made hundreds of investments since he founded SoftBank in 1981 and during the dot-com bubble was briefly the world’s richest man. But the vast majority of those deals failed, and Son’s reputation rests almost solely on one transaction: an investment in Alibaba Group Holding that started with $20 million in 2000. SoftBank’s stake is now worth about 14.5 trillion yen ($129 billion), one of the most lucrative venture investments of all time. But many people think that was a fluke. Son got lucky one time. Can he do it again? The latest deal-making spree began in September of 2016. Mohammed bin Salman, deputy crown prince of Saudi Arabia at the time, flew to Tokyo as his country was looking for ways to diversify beyond oil. He met with Son, who pitched the idea of setting up the largest investment fund in history to finance technology start-ups. In less than an hour, bin Salman agreed to become the cornerstone investor. “Forty-five minutes, $45 billion," Son said on The David Rubenstein Show in September. “One billion dollars per minute." Son didn’t wait for the money to come in before starting to cut deals. He made about 100 investments last year with a total value of $36 billion, according to research firm Preqin. That’s more in dollar terms than Silicon Valley’s top two heavyweights, Sequoia Capital and Silver Lake, combined. “It’s 100 percent Masa," says one CEO who agreed to sell Son a stake in his company. “Okay, 99.9 percent Masa." Son typically brings in his bankers when there’s a complex deal structure, like in the Uber deal. In that case, SoftBank bought most of its shares through a tender offer with tricky legal aspects because of a nasty board dispute and the many investors involved. The SoftBank spokesman said decisions are “made by the organization after due diligence and process." Son has an unusually personal approach. He often invites founders to Tokyo to talk face to face, conversing in English. He’ll typically begin with a formal meeting in one of his conference rooms on SoftBank’s 26th floor. Then Son, his guest and staff will move to the private dining area on the same floor, according to people who have attended the meetings. Visitors can wander in his garden or relax on traditional tatami mats. Son’s personal chef prepares Japanese specialties. Big-screen TVs often play SoftBank Hawks baseball games. There’s little small talk though. “He asks a lot of questions," says Greg Wyler, the CEO of satellite provider OneWeb, which received a $1 billion SoftBank investment in December 2016. “If you like thinking really hard and really fast and you like thinking through the art of the possible, it’s a wonderfully motivating experience." Son’s staff does due diligence before he meets with start-up founders. So he has a good sense of whether he wants to invest before the meeting starts. His questions are usually focused on prodding founders to think more broadly about opportunities. Eugene Izhikevich was invited to Tokyo in May. A prominent Russian neuroscientist who lives in San Diego, he runs a start-up that builds brains for robots. Izhikevich pitched Son on investing “tens of millions" so his company could develop robots that would find widespread use in a decade or two. “He interrupted me in the middle of my presentation and said, ‘I got it,’" Izhikevich says. “How much do you need to achieve your vision?" The Russian realized Son wanted to give him more money than he was requesting—on the condition that Izhikevich accelerate his work. Son didn’t want to wait 10 or 20 years. He wanted a full range of robots in three to five years. “Robots everywhere, that’s the vision we share," Izhikevich says. “What drives me crazy is how slow things are. In Masa, I found my match." In July, SoftBank announced a $114 million investment in Izhikevich’s Brain Corp. The Russian appreciates the money, but admits he now feels the pressure of living up to Son’s expectations. Son is largely hands-off after cutting a cheque, though he stays in touch with founders by phone and email. He sits on the boards of a handful of companies, including Sprint, Alibaba and ARM Holdings, the chipmaker he acquired in 2016 for $32 billion in the biggest deal of his career. He did get deeply involved in the operations of Sprint as that company struggled. While some question the wisdom of giving entrepreneurs more cash than they’re looking for, there’s another way to look at Son’s 2017 Blitzkrieg. He’s gotten SoftBank big stakes in more than a dozen of the most prominent start-ups in the world, including the two most valuable (Uber and Didi). In the process, he’s shown he can help entrepreneurs chase ambitious, expensive dreams with a single cheque. “For all of the founders I work with, he is now the first name on their list," says Mark Tluszcz, who co-founded the venture firm Mangrove Capital Partners. Son has faced sceptics his entire life. He grew up on the southern Japanese island of Kyushu, bullied as a child because of his Korean ancestry. His father more than made up for the abuse, doting on his son and praising him as a genius for his business acumen. Son left Japan at 16 to study in the US and launched his career as an entrepreneur while at the University of California at Berkeley. He brought Space Invaders game machines from Japan to the US and invented an electronic translator that he sold for about $1 million. Son likes to talk about how he proved doubters wrong after returning to Japan to build his empire. He made early investments in Yahoo! and Yahoo Japan, as well as Alibaba. He took over Vodafone’s Japanese wireless operation when everyone thought the business was hopeless and, by persuading Steve Jobs to give him exclusive rights to the first iPhone in Japan, turned it into a fierce competitor. He stumbled plenty, too. During the dot-com boom, Son was one of the most enthusiastic investors—backing more than 800 start-ups to create what he called a “netbatsu," the digital-age equivalent of Japan’s zaibatsu conglomerates. But with the crash, almost all those companies failed. Son had the distinction of losing more money than anyone else ever had—$70 billion. Son doesn’t use the same term these days, but what he’s assembling resembles his old netbatsu. He describes the people at the start-ups he’s backing as “comrades" and how they’re part of the broader SoftBank Group. He talks about opportunities for SoftBank-backed companies to collaborate—even when all they have in common is his money. Chris Lane, an analyst with Sanford Bernstein, says about eight in 10 of the investors he talks with are skeptical of Son. They see him as a solid telecom operator who is taking enormous risks with his investments and has demonstrated no special skill in technology investment. Lane sees clear evidence of that disbelief: SoftBank’s stock in Alibaba and other assets are worth more than 19 trillion yen after subtracting all its debt, but SoftBank’s market cap is only 9.8 trillion yen. It’s like your neighbour having a suitcase stuffed with $1 million in cash, but you’ll only pay him $500,000 for it because you think he’ll lose the rest on the way to your house. Critics not only don’t believe Son can pick the next Alibaba; they’re convinced he’s going to squander what he already has. “If you think of this as a telco making unrelated investments and likely to lose money, then maybe the discount is right," Lane says. “If you think this is a sophisticated technology investment firm with a strong track record, then this is an unbelievable opportunity." Lane initiated coverage of SoftBank in October with a buy rating because he’s a believer—he sees Son as the Warren Buffett of the tech industry. But since then, the discount from Son’s assets to his market value has widened from 41% to almost 50%. Son has talked about the discount regularly on investor calls, sounding frustrated at times and elated at others. In May, he compared SoftBank to the goose that lays golden eggs, arguing his company doesn’t get credit for its eggs much less the goose itself. “The goose has more value than the golden eggs. I don’t know how you don’t think this,’’ he said, then later added, “if you ask me, it’s better to be undervalued because it leaves room for growth." Perhaps no Son investment is more important to his reputation than the one in Uber. The SoftBank chief is betting heavily on chief executive officer Dara Khosrowshahi, who has pledged to repair a toxic culture, overcome regulatory pushback and take on mounting competition before leading Uber to a successful IPO. “This is a critical test for SoftBank and whether they can deploy large amounts of money in late-stage investments," Lane says. “The market will judge [Son] by the Uber IPO." Son holds a potentially commanding position. 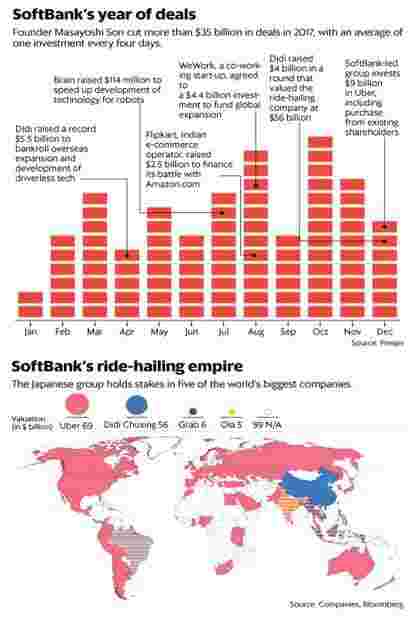 SoftBank has stakes in the biggest ride-hailing start-ups in the US, China, India, Brazil and Southeast Asia. Four of the SoftBank-backed start-ups compete with each other, including in key markets like India and Indonesia. So Son may encourage the rivals to make peace, merging operations in certain countries to save billions in subsidies for drivers and customers. For example, Grab, the largest ride-hailing service in Southeast Asia, may acquire much of Uber’s operation in the region, according to a person familiar with the matter. Didi could also move to acquire Grab to accelerate its expansion beyond China. But there’s a limit to what Son can do. He doesn’t hold controlling stakes in any of the companies, including Uber and Grab. So he can’t force them into deals if management or other investors resist, but he may help them see their own economic interests. “SoftBank will do its best to eliminate unhealthy competition," says Bernstein’s Lane. Longer term, Son will have to do a better job articulating how his deals fit together. At the company’s annual shareholders meeting in June, he closed with an awkward video the company has used for years to explain its view of technology’s future. It opens with a blond man wandering among stone ruins. “Sorrow is inherent to the human condition," he says, staring into the camera. “Since the beginning of time, humans have sought to overcome sorrow." The clip goes on to explain how technology will connect people on opposites sides of the world and allow them to share thoughts and ideas. It closes with the man wading through a field of waist-high grass. “Together we’ll open the doors to a new century of happiness and joy," he says. Bafflement ensued. Even as his allies describe it, Son’s vision seems like garden-variety optimism about a technological future that has been enunciated by many industry leaders: a trillion connected devices, generating data that will be analyzed by artificial intelligence to supposedly make the world a better place. At a SoftBank conference in July, Son took the time to answer critics who say Alibaba is his sole success. He flashed a slide citing his other successful deals and another showing his investments have returned 44% annually including Alibaba—and 42% without it. Anthony Tan, who co-founded the Grab taxi-hailing service, recalls first meeting Son a few years ago when the Japanese billionaire was considering investing in his start-up. As the two chatted, Son mentioned his early support for Ma, then an unknown school teacher who is now the richest man in China. “Years ago, Jack Ma sat there," Tan recalls Son telling him. “Anthony-san, you take my money. It’s good for you. It’s good for me. If you don’t take my money, not so good for you."